There are lots of places where you can buy replacement windows in Harrisburg, but none offer you the quality, energy savings and professional installation that you’ll find with Renewal by Andersen. Discover for yourself what makes our windows the best replacement windows in Harrisburg and in all of Central PA. Speaking of keeping your energy bills down, you’ll be amazed at how the best replacement windows in Harrisburg save you money over time. 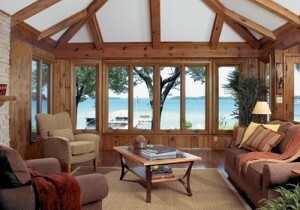 Windows from Renewal by Andersen can save you plenty on your energy bills in the winter as well as the summer. Consider how much money you’ll save by being able to keep the thermostat a few degrees lower during those frigid winter months, or a few degrees higher during the blistering heat of summer. Here to help Robert with more windows! Here helping Paul and Patricia with their old worn out wooden windows. Here helping Jeanie with her old worn out windows! Assisting Clea with her old worn out windows! Of course, having the highest-quality, most energy-efficient replacement windows in Harrisburg doesn’t mean a thing if they’re poorly installed. At Renewal by Andersen, we use only the best, certified installers who will make sure that each of your windows is a perfect fit. In fact, we’re so confident in our installation that we guarantee the quality of windows installed by Renewal by Andersen-authorized installers for 20 years from the date of installation. So if you’re looking for the finest replacement windows in Harrisburg, look no further than Renewal by Anderson. There’s no reason to live with those old, drafty windows anymore.